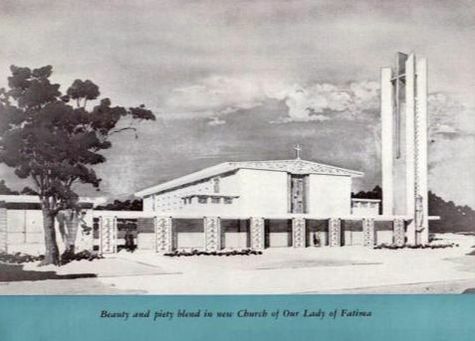 IN GENERAL DESIGN AND APPEARANCE, the new Church of Our Lady of Fatima combines modern ideas with liturgical tradition. The new, safe and economical materials and scientific devices of the Twentieth Century lend their strength and convenience to serve the eternal functions of a house of worship. Two factors were given primary importance in designing the new Church. One – worshipers must be able to see the whole Sanctuary from any seat in the building. Two – they must be able to hear the words of the celebrant during Holy Mass and other ceremonies. 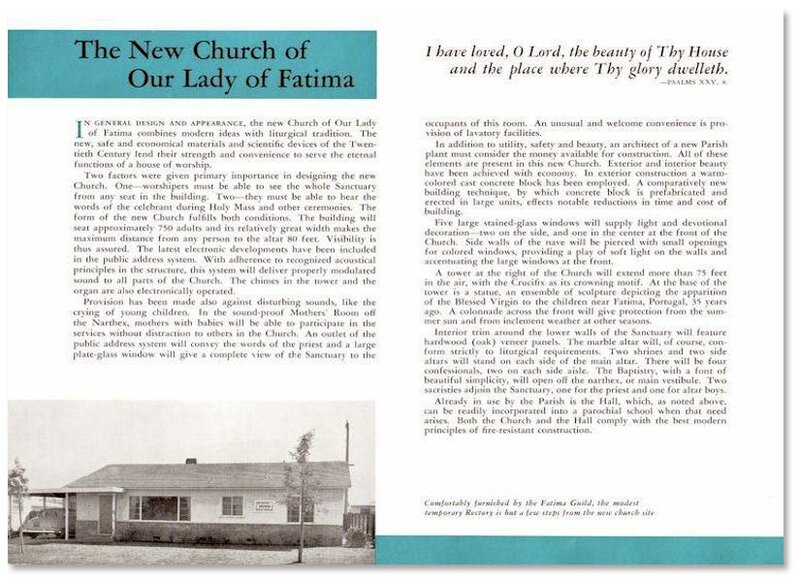 The form of the new Church fulfills both conditions. The building will seat approximately 750 adults and its relatively great width makes the maximum distance from any person to the altar 80 feet. Visibility is thus assured. The latest electronic developments have been included in the public address system. With adherence to recognized acoustical principles in the structure, this system will deliver properly modulated sound to all parts of the Church. The chimes in the tower and the organ are also electronically operated. Provision has been made also against disturbing sounds, like the crying of young children. In the sound-proof Mother’s Room off the Narthex, mothers with babies will be able to participate in the services without distraction to others in the Church. An outlet of the public address system will convey the words of the priest and a large plate-glass window will give a complete view of the Sanctuary to the occupants in this room. An unusual and welcome convenience is provision of lavatory facilities. In the addition to utility, safety and beauty, an architect of a new Parish plant must consider the money available for construction. All of these elements are present in this new Church. Exterior and interior beauty have been achieved with economy. In exterior construction warm-colored cast concrete block has been employed. A comparatively new building technique, by which concrete block is prefabricated and erected in large units, effects notable reductions in time and cost of building. Five large stained-glass windows will supply light and devotional decoration – two on the side, and one in the center at the front of the Church. Side walls of the nave will be pierced with small openings for colored windows, providing a play of soft light on the walls and accentuating the large windows at the front. A tower at the right of the Church will extend more than 75 feet in the air, with the Crucifix as its crowning motif. At the base of the tower is a statue, an ensemble of sculpture depicting the apparition of the Blessed Virgin to the children near Fatima, Portugal, 35 years ago. A colonnade across the front will give protection from the summer sun and from inclement weather at other seasons. Interior trim around the lower walls of the Sanctuary will feature hardwood (oak) veneer panels. The marble altar will, of course, conform strictly to liturgical requirements. Two shrines and two side altars will stand on each side of the main altar. There will be four confessionals, two on each side aisle. The Baptistry, with a font of beautiful simplicity, will open off the narthex, or main vestibule. Two sacristies adjoin the Sanctuary, one for the priest and one for altar boys. Already in use by the Parish is the Hall, which as noted above, can be readily incorporated into a parochial school when that need arises. Both the Church and the Hall comply with the best modern principles of fire-resistant construction. the modest temporary Rectory is but a few steps from the new church site.